NOTE: This article first appeared on the McGladrey Consulting Pros blog. 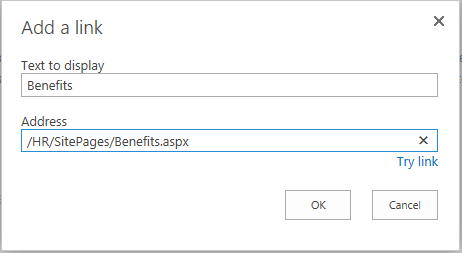 Brilliant Site and information, need to know about building an Intranet in SharePoint 2010.
so may i know what should i do.. how to create, multiple link boxes in one page. kindly please help on this. thanks. Hi Eric, I think that you should create a new library/links or whatever for each product. It you then put it on your site you have to choose app part Product1 and then add app part Produkt2. I am trying to create two new subsites and everytime it says, the website IT is in use. I only have 2 subsites, HR and Calendar so what can I check to fix this? Rudy, are you able to create a new subsite with some other name? I’m wondering if a site called IT was created at one point and got corrupted or something, so it’s not showing in your site contents page. If you can’t create a new site at all, with any name, then that’s a much bigger issue. Thank you for this wonderful explanation of subsites vs pages. I opted for subsites but now am stuck on how to share staff list in HR subsite to be used in Assests list in Admin subsite. How can you make a column in Staff list in HR subsite appear as a lookup field in Assests list in Admin subsite when both subsites are at the same level with parent as root site? Your suggestions in designing this sort of structure will be most appreciated. Many thanks. Hi Shareef, you have two options. 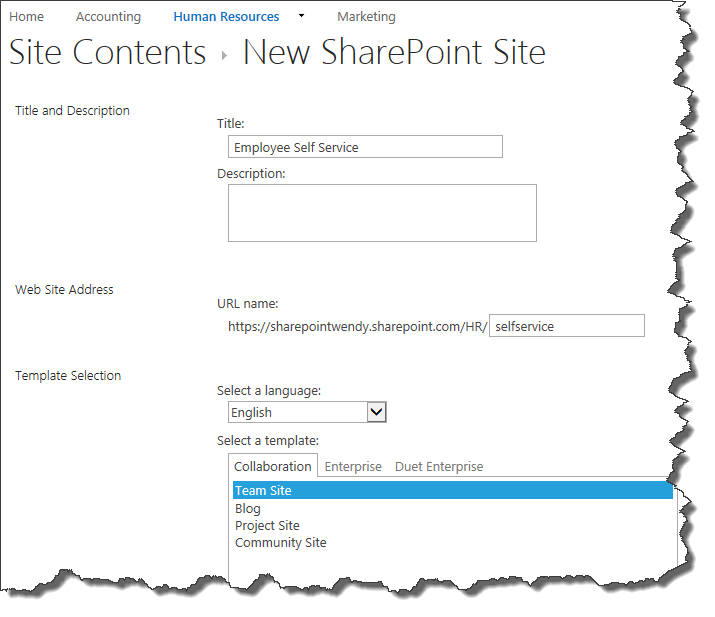 1) You could move your staff lookup list to the root site collection and then create a lookup site column in the root site collection that pulls from that list (to create a site column, goto Site Settings > Site Columns > Create). Then you can add this site column to any list or library on your site, including those in sub sites. 2) Another option would be to utilize the managed metadata service and create a managed metadata site column (if you have that option available with your subscription) instead of a lookup column. Create this site column at the root of your site collection as well. I was wondering if you have this information for SPOL? For my site, I go to Site Contents and at the bottom of the page it says “This site does no have any subsites” and has no option to add any (as in there is no blue plus). I tried to go to Navigation through the site setting and that option was nowhere to be found, clicked all of the links in the Look and Feel section. Everything mentioned in this post should also apply to SharePoint Online. In fact, all the screenshots were taken directly from my SPO site. Perhaps you don’t have the proper permissions to create subsites, or there is another issue with your account. I would suggest contacting your site administrator (if someone other than you) or your Office 365 admin – usually someone in your IT department – for assistance. Thank you, Wendy. I got it to work. I appreciate your help. I’m the Office 365 Admin and the IT director for my company. Rudy, great! Glad to hear you got it working. Wendy, any way to use web parts from a main site in the Subsites? Rob, could you elaborate on exactly what you’re wanting to do? I’m working on a SharePoint site that has a volunteer page. Within that volunteer page there are five categories, each with a clickable image link to it’s own page. My issue is when I go to post a volunteer opportunity in one of the select page categories, the opportunity appears on all five pages instead of just the one I’m posting in. How do I resolve this? Hi Cassondra, without being able to see your environment, it sounds like all 5 of the pages are showing all categories and aren’t filtered properly. Double check that the filters are set to only display the relevant category for each page. Thank you Wendy. I’m very, very new to Sharepoint. Where would I go to modify the filters? We have our main team site setup and I need to add a separate site to support a new part of the business; this new site will have it’s own distinct users. Is it preferable to create a new team site at the ‘root’ level or a subsite to the existing team site? None of the info in the existing team site is applicable to the new part of the business. I’ve managed to add some apps to a current page (a library). I’ve created another page (I think it is a subpage) but when I try and add apps, none of our company ones are there (including the ones that I have created). Is there something that turns on or off the availability of our apps to a page? Practical commentary – I loved the information – Does someone know if I could get access to a blank a form document to type on ? Hi Wendy! 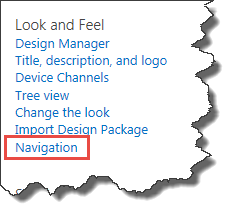 Thank you for so usefull information, I am new to sharepoint and loved this info. My question is if it is possible to convert a page to a sub-site? We have a number of pages, but are thinking that it may be beneficial to have sub-sites since we would like to have unique permissions for each site. We are nearly at the 5000 documents on our site. Would setting up subsites help this issue?? Kim, not necessarily. You could either create another document library and move your old documents to that one (like an Archive library), or just create views that don’t display more than 5000 documents. Document libraries can actually contain many more than 5000 documents, they just limit the user interface to displaying 5000 at a time to reduce performance lag. Was this copied word for word from this site? http://www.rsmusconsultingpros.com/sharepoint-create-page-vs-sub-site; the link here (RSM Consulting) posted this a month prior to Wendys post. thank you for the great article. I have one question, I keep looking for an answer and maybe its confusion over the words Permissions. I want to create either a folder or subsite under HR for different levels of compensations and not viewable by the whole team site, only viewable by just certain groups of users to be able to access this information? First, thank you for this information – very useful! Second, I am hoping you could help with a request. I have created a 2-column page in SP2013. With our Document Library inserted as a web part into one column, I created hyperlinks to the doclibs different Views in the left column for easy access. However, if I click the view hyperlink it navigates off the page and directly to the library. Any ideas on how ti make it apply the view to the inserted document library web part? 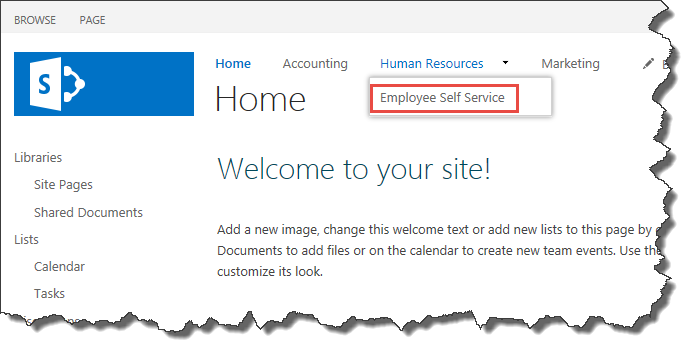 Novice to SharePoint, I recently took on the roll of creating our office SharePoint Worksite…and I am loving getting to know SharePoint. But I am having problems creating a multi-task for several users. When the first person created his task the system gave 100% completion, but not everyone had completed the task. How do I created a task, that will let me know when each user has completed the task? Your assistance is greatly appreciated. Wendy, although this post is several years old the content is still relevant to my situation. I’m a new user, although I have a consultant helping me. I’d like to understand what he’s doing and why so that I can make intelligent suggestions. Thanks for the post.